Kids always delight in playing silly pranks on their parents, which is why the first of April is so popular among youngsters everywhere. This year, we thought it would be fun to turn the tables and suggest a few innocent gags to play on the kids. While we at the Children’s Museum would never suggest “mean” jokes or tricks, we can definitely get on board with some light-hearted fun! Read below for some ideas that are sure to get a confused chuckle out of your little ones! This trick is not only funny, its tasty too! The best part is that the kids will get a yummy treat once they realize that the cup is filled with jello, not juice! Empty the contents of one package lemon-flavored Jell-O into a pitcher. Add one cup boiling water and stir until powder is completely dissolved. Mix in one cup cranberry juice. Pour mixture into small juice cups and place a straw in each. Refrigerate until set, at least 4 hours. This one is sure to leave them scratching their heads! Place a couple drops of food coloring in their breakfast bowl and cover it with cereal. Watch them be amazed as the milk you pour in changes color before their eyes! Place food gel dye around the inside of your bathtub faucet. When bathtime comes, watch your little one’s surprise when the water comes out colored! 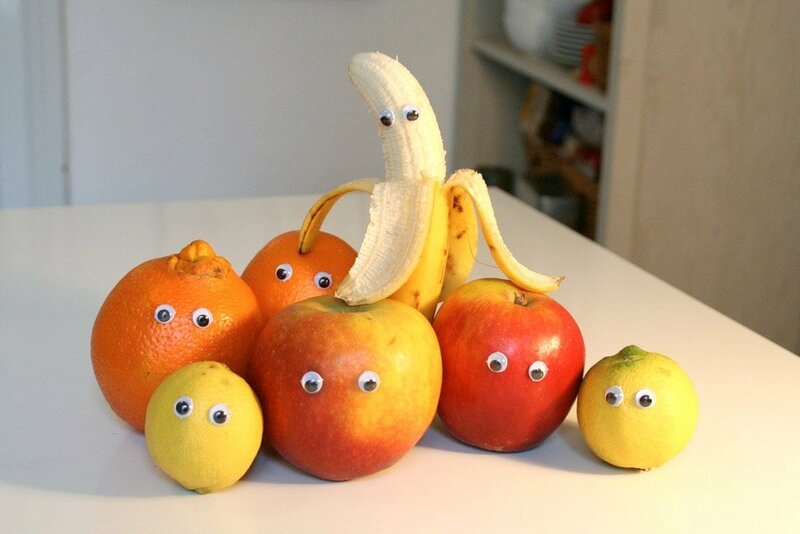 Place google eyes on all of your produce or items in the refrigerator. Watch your children delight in the silly scene! We hope these silly pranks brought some laughter to your day! Looking for more great ideas for crafts and activities? Check out all our boards on Pinterest!